"Wayward daughters. Missing husbands. Philandering partners. Curious conmen. If you've got a problem, and no one elese can help you, then pay a visit to Precious Ramotswe, Botswana's only - and finest - female private detective"
Livre reçu dans ma BP lundi 14.06.2004. Lecture déjà entamée... prévoir 1 à 2 semaines maximum avant de le faire suivre au Bcer suivant sur la liste. Commentaires avec un futur Journal Entry après lecture. Merci à lesezeichen pour l'envoir du bouquin. appreciated the 2nd bok this serie "Tears of the giraffe" and I will certainly try to read books nr. 3 and 4, i.e. "Morality for beautiful girls" and "The Kalahari typing school for men". Easy to read and nice humor. Book will soon be sent to the next one on the list (I will PM). Book has left here on 23/07/2004 to the next Bcer on the list i.e. Whish good receipt of the book and happy reading ! Got it in the post on Monday, but I'm not on the internet at home at the moment so I had to waith until today to journal it at work. I finnish this book last weekend and really enjoide it. I'm looking forward to the the next book in this series. Posting it to kanapoutz on monday. Will read it very soon. Really enjoyed it! Exotic and funny, and Mma Ramotswe is such a great character! Thanks Lesezeichen for resurrecting this ring! Waiting for Eirinn's adress to send it on. So I'm sending the book to RoryG, it's going today. Got it! Can't wait to get to it. I have another bookring before this, but I'll be getting to this one pretty soon. I think the book was ok, but I was expecting something more. I thought it would be more a detective story and it was more about the life of Mma Ramotswe. It wasn't like I coudn't put it down. It was entertaining, but it doesn't make me feel excited about the next part of the series. So, I probably don't read the next one. I'll send the book on it's way as soon as I get the next person's address. Hooray! I've wanted to read this book for quite some time. Thanks, RoryG for sending it on. I'll journal again when I've done reading. A lovely lyrical book about a woman from Botswana who loves her country and her life, and who supports herself through her detective agency. A charming glimpse into a country about which I know very little. Thanks to all who helped get the book to me! Will send on to whitepine on my next post office trip. In mail today to whitepine. Just received this book in the mail . I am currently reading another "CAtch" but this book is next. I enjoyed this book and will read more by this author . The book is on it's way to portugal. Received today.It comes at a good time because I just finished another bookring. That was quite entertaining and the main character is quite endearing.Plus having Mozambican origins I always like to read about southern Africa.I don't think I will buy this author's books but I will certainly read him of one of his books falls into my hands. The book has made its way home. Thanks everybody for your journal entries and for moving the book around so fast. It was really a pleasure! 'See' you! Edit 14.05.: Sent to e-marmotte today. Enjoy! Lucky me who is being treated with a second round of this bookring (actually, a third round) just by asking for it on the French Forum! This proved to be an entertaining and educative reading, although I must say I might have expected more... Now, am I ready to go on with the adventures of Mma Ramotse ? Why not, but not before a few weeks, when I am eventually done with all my ongoing rings and self TBR pile ! 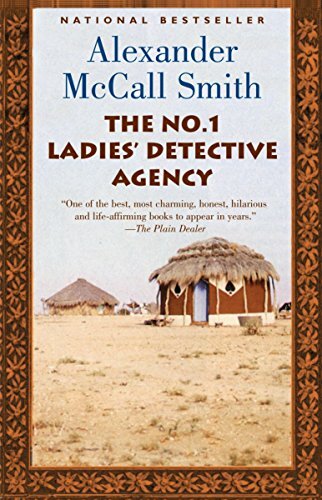 O/T: I happened to read your JEs on an other serie by Alexander McCall Smith (starring another female hero, Isabelle Dalhousie) and even though I am not ready to follow her adventures as yet, I must say I had great fun reading your exchanges about the book ! (The N°1 Ladies' Dectective Agency is on its way to KatColorado). Thx for organising the bookring lesezeichen and for sending it to me e-marmotte. Precious Ramotswe is very different from all the private detectives I've ever read about. Maybe too different. I liked the insight in the African way of thinking. One time Mma Ramotswe mentions what she will do once she has enough money to retire: She will sit on the porch and drink tea with her friends, every day. She can't understand why white people are always in a rush. While I like the image of doing nothing at all I don't think I would be satisfied very long with it. I will pass this book on to nice-cup-of-tea as soon as I see her. Passed on to me by KatColorado at last night's bookclub. Thanks! This was a lovely book and an engaging read. I loved the honesty and humour of Precious Ramotswe, and her knowledge of people! Plus, any heroine who drinks that much tea, is ok by me!
" 'We are the ones who first ploughed the eart when Modise (God) made it', ran an old Setswana poem. 'We were the ones who made the food. We are the ones who look after the men when they are little boys, when they are young men, and when they are old and about to die. We are always there. But we are just women, and nobody sees us.' "
I received the book today! Thanks, nice-cup-of-tea! I read the book during my holiday in sunny Greece and it was a perfect beach-book! Short chapters and a happy end. I really like the main character, Mma Ramotswe, and I am definitely going to read the following books. The book is going to travel to Rohrspatz in Germany as soon as I get the address. off to rohrspatz tomorrow! enjoy! I am writing to keep you guys updated. After sending the book off to Rohrspatz in September, I never heard from the book again... So I sent a PM to Rohrspatz and asked her if she got the book at all. Rohrspatz confirmed by PM that she received the book in the mail in September 2005, but somehow she had forgotten to journal it. Now I wanted to remind her again, but I found a post in the german forum that she is moving so all her books are in boxes ready to move to her new place. I posted in her forum thread to please make a journal entry as soon as possible after she completed her move. I just wanted to let the bookring-originator know that the book was not lost in the mail or something. As allbookedup already said the book arrived here safely. I read the first two chapters but didn't get on then. As I'm moving and having several Bookrings in my house I'm going to send this on of to J-Sama without finishing. To J-Sama in Czech Republic. Enjoy! I went to the bookstore today and saw the book in the shelf. I wanted to buy it and then I thought Hey wait a moment that is the book that is supposed to be comming via mail. So after I got home, I went to the reception of the students hostel where I'm currently staying, looked at the book where the incomming mail is written in and found out that the book had already arrived two days ago. Well thanks for sending and organizing the bookring. I will read it as soon as possible. an I think I'll read other books of the series when I come across them. The only thing is, that you need to know something about african history in order to understand some of the conflicts. And a glossary with the explanation of some african terms would have been nice. Wow, this book will always be special for me after its 2 succesful trips and with the many countries it has visited! Thank you all so much for participating and thanks as well for the "Lesezeichen" (bookmarks) and the tea I have received along with the book!